The Memorial Evening to honor the Khojaly genocide victims will be held in Prague on February 27. The event will be held by the European Azerbaijan Society (TEAS) under the auspices of the international Justice for Khojaly campaign. 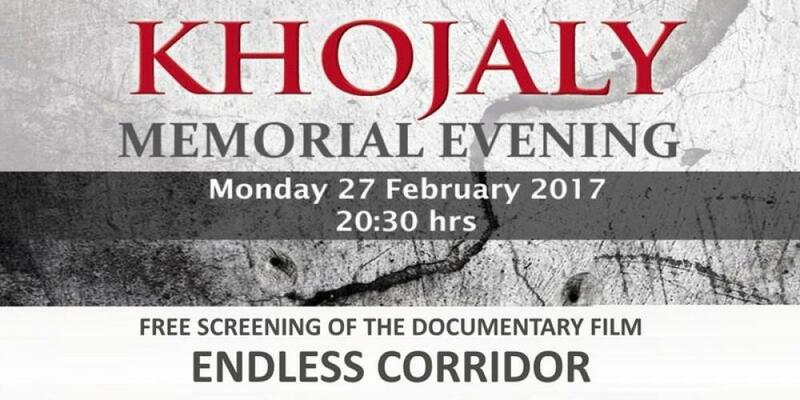 The documentary film “Endless Corridor” in remembrance of Azerbaijani civilians, who tragically lost their lives on February 26 1992, in the Azerbaijani town of Khojaly will be screened as part of the event. Endless Corridor follows two journalists, Lithuanian Richard Lapaitis and Russian Victoria Ivleva, on their return to Azerbaijan 20 years after covering the horrific Khojaly Massacre during the Armenian–Azerbaijani Nagorno-Karabakh conflict. They journey to find the survivors they had first met in the aftermath of the Armenian attack. The film includes interviews with the survivors and spine chilling admissions from the perpetrators. A riveting documentary that unfolds like a dramatic narrative with exceptional lighting and cinematography is narrated by Jeremy Irons, the Oscar-winning British actor. The Emmy-winning American producer Gerald Rafshoon was the Executive Producer. The movie received praise from international critics after being screened internationally throughout 2015. After receiving the Best of Show Award from the prestigious Accolade Global Film Competition in the US, it was awarded the Best Documentary and Best Director for a Documentary Prizes at the Tenerife International Film Festival in Madrid and the Best Documentary Editing Prize at the Milano International Filmmakers Festival. It has also been screened on the pan-European Eurochannel, Israeli Channel 1, CNN Turk, Turkish TV 24, London Live and Al-Jazeera channels. About 613 civilians mostly women and children were killed in the massacre, and a total of 1,000 people were disabled. Eight families were exterminated, 25 children lost both parents, and 130 children lost one parent. Moreover, 1,275 innocent people were taken hostage, and the fate of 150 of them remains unknown.